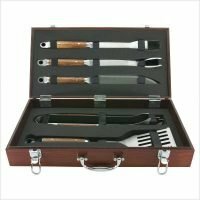 The 3 piece barbecue grill tool set by Mr. Bar-b-q features rosewood stained hardwood with rubber grip handles and non-stick surfaces. 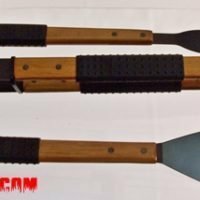 The 3 piece grill tool rubber grips are for comfort and can make grilling easier for those who don’t have a strong grip. 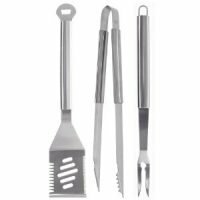 At 20 inches long these tools will keep your hands away from the heat of your grill. 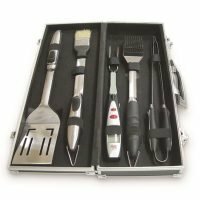 The non-stick coating covers the entire metal surface of all 3 tools to ease the cleanup. 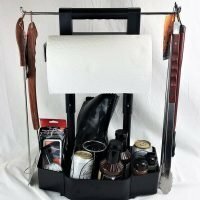 Each tool has a leather loop through the top for hanging from your grill or while stored. 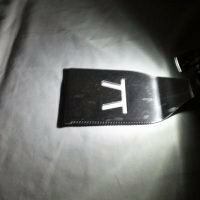 The 3 in 1 spatula has cutting edges on either side of the blade, one of which is serrated. The tongs are a sprung steel design. 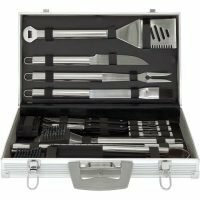 Care of: The tools included this set should be hand washed with soap and water to protect the non-stick coating and the hardwood handles. You may also wish to wipe down the handles with a wood oil every once in a while to extend the life. Do not place anything with hardwood handles or rubber into a dish washer the moisture and heat will eventually dry it out. Dishwashing detergents and metal scrubber are abrasive and hard on the finish and should be avoided.